This book of photographs paired with short essays is due out in the next two weeks. I want to give you ample time to order one for delivery on publication. Teju Cole’s art is exceptional at the same time it is accessible. In my experience, the confluence of these two things happens only rarely, which is how Cole has come to occupy an exalted place in my pantheon of artists. If I say his photography can stop us in our tracks, it says nothing of his writing, which always adds something to my understanding. Today I discovered his website has soundtracks which open doors. And there it is, his specialness: Cole’s observations enlarge our conversation. This may be the most excellent travel book I have read in recent years, the result of years of near-constant travel by the author. Scrolling through the Table of Contents is a tease, each destination intriguing, irresistible, stoking our curiosity. Each entry is accompanied by a photograph, or is it the other way around? Yes, this is my favored way of travel, for “the shock of familiarity, the impossibility of exact repetition.” It is the reason most photographs of locales seemed unable to capture even a piece of my experience. But Cole manages it. In the entry for “Palm Beach,” his picture is of a construction site, a pile of substratum—in this case, sand—piled high before an elaborate pinkish villa. His written entry is one of his shortest, only three sentences, one of them the Latin phrase Et in Arcadia ego, washing the scene with knowledge of what we are viewing, and what is to come. Cole calls this work a lyric essay, a “singing line” connecting the places. There is some of that. What connects all these places for me are Cole’s eyes…and his teacherly quality of showing us what he is thinking. It is remarkable, and totally engrossing. Yes, this insight, so obvious written down, is something I have been struggling with for such a long time, going back and forth over the idea that we are the same, we are different. 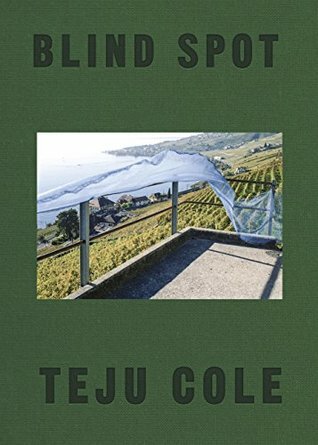 Cole tells us that this book stands alone, or can be seen as fourth in a quartet addressing his “concern with the limits of vision.” I want to sink into that thought, in the context of what he has given us, because outside the frame of a photograph, outside of our observation, outside of us, is everything else. My favorite among the essays, if we can call them such, filled as much with what Cole did not say as with what he did, is the piece called “Black River.” Cole evokes the open sea, Derek Walcott, crocodiles, and white egrets. A tropical coastal swamp filled with crocodiles also had white egrets decorating the bushy green of overhanging mangroves, the large white splashes almost equidistant from one another, the closest they can be for maximum happiness, I like to think, t hough it could also be minimum happiness, I guess. Any closer and there will be discord, like the rest of us live. The arrival in bookstores of a book by Teju Cole is an event. His pictures makes us look, and his words are like the egrets, spaced for maximum pleasure. Whether or not you read this as a series or alone, make sure you pick it up, just to gaze. You need have no agenda. His magic does not make much of itself. He takes us along for the ride. Bravo!